Earlier this year, access to information documents obtained by the Forum for Research and Policy in Communications revealed that Bell had presented its plan for website blocking to CRTC officials months before it was formally filed to allow for public review and comment. As far back as July 2017, Bell pressed a CRTC commissioner for a meeting, which led to a Commission presentation in September 2017. 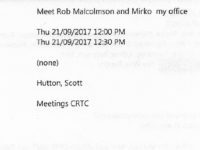 The CRTC downplayed the meeting, telling reporters in response to queries that there was a meeting with Commission legal staff on September 21, 2017.